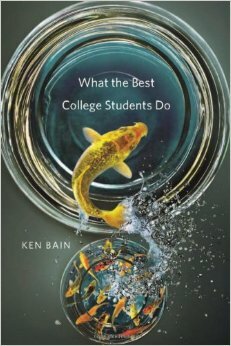 Two years ago, I read Ken Bain’s book What the Best College Teachers Do after it was recommended to me by a colleague at a Lilly Conference, and last summer I re-read the book as a part of a book club on campus. I should clarify…I read the book in one day. Not only was it an easy read, but it felt like Bain was speaking to me…telling me that I am not alone. Please don’t read that to mean that I think I’m one of the best college teachers. Rather, it was more confirmation that the types of learning experiences I try to provide within the classroom are congruent with what the best college teachers do…I just need to keep working at it. The book was so powerful that last fall I decided to read his next book, What the Best College Students Do, with a student who was exploring the process of learning in the classroom. I completed this book feeling a bit disappointed. It felt as if the book was put together quickly, and that the effort to “discover” the best teachers was not the same effort to “discover” the best students (Bain claims otherwise). Instead, it felt more like he asked his friends/people he knew who he thought were good students to share their story about how they became good students. Let’s just say that I kept thinking that Bain and most of his friends/acquaintances have quite a few more resources for their own personal learning than most of the rest of us (certainly more than I have available). “simply better at memorizing formulas, plugging the right number into the equation, and calculating the correct answer on the exam” (p. 4463–kindle). The A grade the students received had little to do with how well they understood course concepts. I agree with Ken’s critique of the grading system, and wish there was a way that I could avoid assigning grades. Unfortunately, my experience with various students leads me to believe that if grades were not offered not all students would do the work, and in order to help them discover a greater purpose for the course than simply getting an A, I find that I need them to do the work. Bain also encourages readers to consider what kind of learner they are, and indicates that a person’s approach to learning is often connected to how they approach their work post graduation. Learning for the sake of learning or to become better by gaining new knowledge/understanding/skills/abilities is not how most students have been socialized to be students. Rather, I’ve experienced students who’ve been socialized to receive an A because they completed the homework and repeated back to me whatever it is that the reading assigned for the day said. My sassy response to these students is that I already know what the authors of the readings said because I assigned the readings. My non-sassy response is more…”okay, that’s a place to start. What do you think about the authors claims?” Psychologists at Goteborg University labeled these students as “surface” learners. “right away if they are going to be good at something. If they don’t get it immediately, they throw up their hands and say, ‘I can’t do it'” (p. 4463–kindle). Yet, most of us know that to lastingly learn something it requires time and commitment…progress is slow, and often involves continual struggle. In order to hang in there as one learns to become good at something, it requires internal motivation and knowing how one learns best. Thus, whatever you think right away about your ability to learn something might not be the best indicator of your abilities. Psychologists at Goteborg University label these students as “strategic” learners. These students, “focus almost exclusively on how to find out what the professor wants and how to ace the exam. If they learn something along the way that changes the way they think, act, or feel, that’s largely an accident. They never set out to do that” (p. 4463-kindle). Bain also discusses characteristics of what he considers to be the “best” students. To Bain these students engage in deeper understanding through reflective questioning of their own mind. They are able to provide empathy to themselves as they acknowledge areas of growth and weakness. They often take it upon themselves to discover connections between their own interests and the assignments they received. “These students tried to comprehend what difference an idea, line of reasoning, or fact made, and how it related to something they had already learned” (p. 4463-kindle). Psychologists at Goteborg University labeled these students as “deep” learners. Perhaps, like me, you were thinking about what category of student you fit in, and you might find that it has changed over time and due to context. I know that is the case for me. Bain discusses how you are not stuck in only being one type of learner for life, but that become a deep learner is often not what students have learned to become. Just spending time now considering how you approach learning has potential to assist you in becoming a deep learner. The choice is yours to make. “To take a deep approach means to take control of your own education, to decide that you want to understand, to create something new, to search for the meaning that lies behind the text, to realize that words on a page are mere symbols, and that behind those symbols lies a meaning that has a connection with a thousand other aspects of your life and with your own personal development” (p. 4463-kindle). This entry was posted in faculty, higher education, student affairs, student learning, Uncategorized and tagged deep learning, faculty member, higher education, Ken Bain, learner, learning, surface learner. Bookmark the permalink. Sarah, this summer my office read “Make It Stick: The Science of Successful Learning,” by Brown, Roediger, and McDaniel. You might consider checking it out (even if you only read the final chapter, which summarizes their ideas and strategies). Thanks as always for sharing your reflections! Thanks for the book recommendation. I will check it out. It is also great to hear that your office read such a book. Kudos to Creighton! Sarah, I love reading your blog and thoughts on this topic. As I move through training and reflect on how I am interacting with it, it is interesting to question what type of learner I am and how/when that has changed. I also appreciate your blog because it has given me an idea for our office book club! Right now it’s more fiction books with a couple of memoirs and I would love to incorporate something like this! Miss you and take care! Thanks, Amber! I love the idea of an office book club. 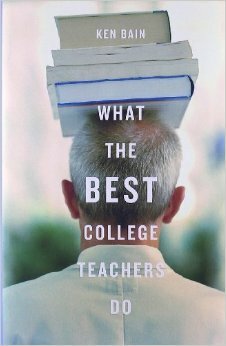 🙂 Ken Bain’s What the Best College Professors Do is a quick, easy, engaging read, so I highly recommend giving it a go as far as a nonfiction books goes. I think folks will find it worth their time. Miss you too!